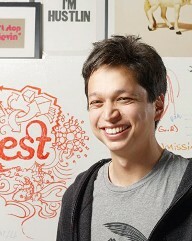 An American Internet entrepreneur; along with Paul Sciarra and Evan Sharp, he co-founded and is CEO of Pinterest, a virtual pinboard which lets users organize images, links, recipes and other things. Pinterest is a free website that requires registration to use and allows users to create and manage theme-based image collections called "pinboards". Examples include events, interests, hobbies and more. Users can browse other pinboards for inspiration, “re-pin” images to their own collections and/or “like” photos. He was raised in Des Moines, Iowa and in 1998; he attended the Research Science Institute at MIT. Subsequently, the gifted student graduated from Des Moines Central Academy and Des Moines Roosevelt with the class of 1999. He then graduated from Yale College in the spring of 2003 with a B.A. degree in political science. Prior to Pinterest, from December 2006 to November 2008, he worked at Google in the online advertising group; however, after a short time with the company he left and started designing his own iPhone apps with a college friend, Paul Sciarra. After their initial application, Tote, failed to gain significant traction, the cofounders teamed up with Evan Sharp to create a pinboard product that would eventually be named Pinterest (which launched in early 2010). He says that the genesis of Pinterest really came from his love of collecting as a kid. “Collecting tells a lot about who you are,” he said, and when they looked at the web “there wasn’t a place to share that side of who you were.” He refined the idea for two mostly unpromising years after he talked a few friends into starting the company, running it from his own apartment. In the summer of 2011 he received his first significant backing from investors. Now with over 60 employees and a spacious office in San Francisco, Pinterest is undergoing exponential growth—growing faster than Facebook and Twitter. It is managed by Cold Brew Labs and funded by a small group of entrepreneurs and investors.